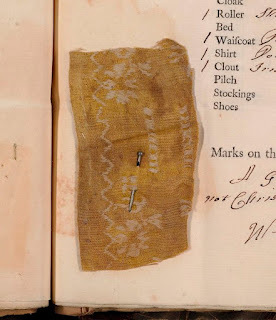 In 2010, I wrote the following post about the exhibition "Threads of Feeling," a sample of the 18th c. tokens accompanying children left at London's Foundling Hospital. Alas, because the exhibition was in London and I live near Philadelphia, I was unable to see it. Now a version of the exhibition has come to America, to the DeWitt Wallace Museum in Colonial Williamsburg, from now until September 1, 2014. I'll be visiting this summer, and will be sure to report then. 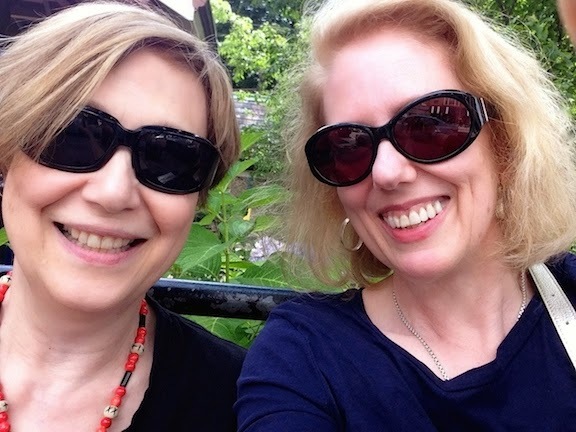 In the meantime, I'm rerunning my original post in case any of you will be in Virginia to see it first. Click here for more information, and here for a poignant slideshow with highlights from the exhibition. Most surviving clothing from the past belonged to upper class women, princesses and peeresses and the daughters of wealthy merchants. But one of the most important collections of 18th c. English textiles came from a far more humble group: the unwanted children given up to London's Foundling Hospital. Created by Royal Charter in 1739, the Hospital was one of the earliest attempts to combine private philanthropy with organized charity. Led by prosperous shipbuilder Thomas Coram (1668-1741), the organizers of the Hospital had two goals: not only to offer a more humane alternative to parish workhouses (in whose dubious "care" over 75% of abandoned children died), but also to provide a suitable workforce for the growing Empire's industry, agriculture, domestic service, and the military. The project became a fashionable charity among the nobility, and was endorsed by Queen Charlotte herself. The Hospital's handsome new buildings included paintings by William Hogarth and a chapel financed in part by concerts given by George Frederic Handel. During the early years, admitted children were given excellent care by 18th c. standards, including inoculation against smallpox, and were taught marketable skills as well as how to read and write. In the beginning, the only requirement for admission was that a child be under two years of age and in good health. Children were to be left anonymously and without questions, and at once the new Hospital became the best hope of desperate mothers. Over 4,000 infants were left between 1741-1760, and the billets cataloguing their admission (and often, sadly, their too-early deaths) have been preserved. Pinned to each child's page is an identifying token that had come with the child. In some cases, this is a tiny linen cap, sleeve, or ribbon rosette, but most often the nurses simply cut a swatch from the clothing the child was wearing when admitted. The tokens were kept in case a mother's circumstances improved and she came to reclaim her child. Almost none did. 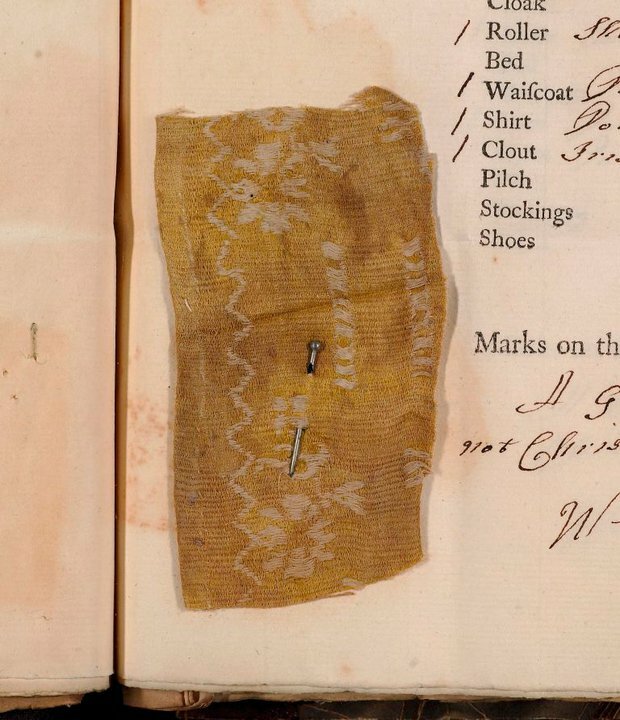 Today the Foundling Hospital is a museum, and a selection of these admission billet pages is currently on display in an exhibition called Threads of Feeling (the show runs until March 6, 2011); the exhibition also has a Facebook page. Eighteenth century children's clothing was most often cut from adult clothing, and the swatches show a wide range of textiles, from the simplest threadbare linen to costly printed silks. While the billets are of great interest to historians and sociologists, as a novelist (and a mother), those little scraps are heartbreaking. They represent the last contact a mother had with her child, her last chance to make her baby "look pretty" for the strangers who could provide a better future than she could herself. If, like most of us, you can't make it to London for the exhibition, a selection of the billet pages appear in the excellent book The Dress of the People: Everyday Fashion in Eighteenth Century England by John Styles. Above: Yellow Satten Flowered. Silk woven in a flowered pattern. Foundling number 13187. A girl aged about 14 days, admitted 20 June 1759. Died 2 July 1759. Photograph from the Foundling Hospital Museum.